It's only taken 5 months from concept to completion but it's done. 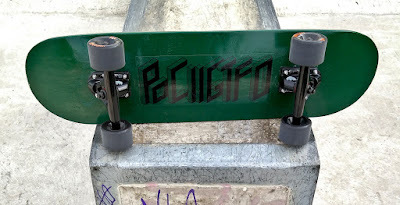 The Poc||GTFO skateboard has finally been for a spin. It all started in January while searching charity shops for books which is something I do a lot. In an out of the way corner was a neglected deck once owned by Alex B. I don't know who he is but his name was Sharpie'd onto the trucks. The weather had been bad for skateboarding for a long time and the goal was to make a deck for riding in bad weather. 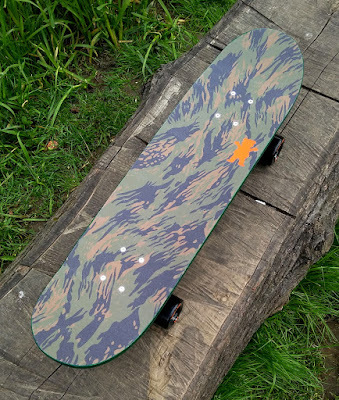 After a lot of work and some substantial purchases I created the deck you can see in the pictures. It's worth as much as my "good" deck but I'll still ride it on wet tarmac. That's what it was made to do. So why the PoC||GTFO name? PoC||GTFO AKA Proof of Concept or Get The F*** Out is a hacker publication. It's something I read to keep up to date with security stuff. My concept was can I hack a cheap Amazon skateboard into something worth riding? I think I've proven that. Having cruised my local park yesterday I can say that it's definitely a decent deck now that it's totally transformed. It's blisteringly fast too. And the weather now it's finished? It's good so I'm off for a cruise.